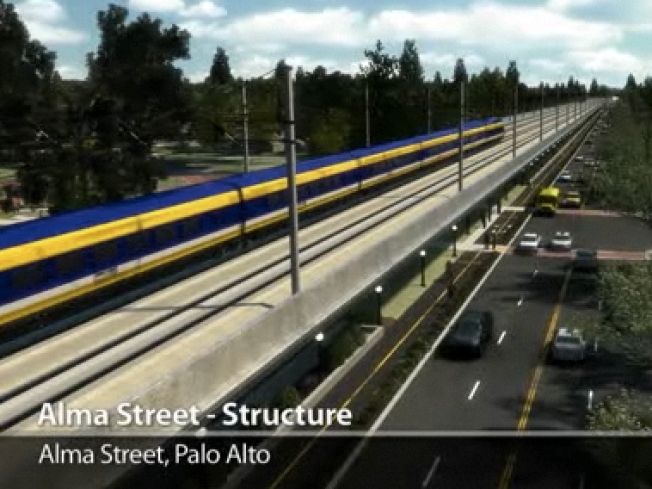 Peninsula residents will have a chance to complain about the proposed raised track platform like this proposed design for Alma Street in Palo Alto. When voters approved a bond measure to fund a high-speed rail project that would connect the majority of the state's residents from Sacramento to San Diego and points in between, you might think that popular support would mean the project was on the fast track. But those points in between, especially in wealthy communities along the proposed San Francisco-to-San Jose leg, aren't necessarily happy about the details -- particularly elevated tracks that would allow trains to avoid intersections. State Senator Joe Simitian, who represents Palo Alto and chairs the Senate budget subcommittee -- and therefore holds the purse strings for the project -- is hosting a meeting on Thursday at Palo Alto's City Hall along with Transportation and Housing committee chair Alan Lowenthal of Long Beach. The latest business plan produced by the High-Speed Rail Authority has come under fire from the Government Accountability Office for unrealistic budget projections. However, any further delays could endanger the billions in federal stimulus spending that the project is depending on to move forward. So while individuals worry about their property values being affected by raised platforms "looming" over their back yards, obstructions could mean that federal money ends up building a bullet train in the Midwest, leaving California struggling along in the slow lane, stuck in traffic on I-5. Jackson West just wishes everyone would hear the "all aboard" call.